Editor’s Note: I’m proud to share with you that a “decades-in-the-making” book from my dad, Frank Lessiter, who helped launch a small, focused publication in 1972, is now complete, with books in-house. Not only did Dad’s coverage of this then niche method of farming help spur an agricultural movement, but also a family-run business we enjoy today in Lessiter Media, which includes our dealer titles of Farm Equipment and Precision Farming Dealer, among others. One fall morning, I was scooped up and walked to my mom’s Red Cutlass and put in the backseat alongside my dog. A few hours later, Mom hurried me upstairs and dropped me in a barren bedroom. “Sit here quietly until your sisters come get you,” I recall, about 15 minutes before I got into trouble for the first time in my new home. The year was 1972. I was 3 years old. I learned years later that the move to this place called Wisconsin was so Dad could run something called No-Till Farmer (NTF). I’m personally proud today to tell you that Frank Lessiter’s new book, From Maverick to Mainstream: A History of No-Till Farming, has arrived. It’s Dad’s 4th book in a long and influential career as an ag journalist. It’s a story that needed to be shared, and it’s worth celebrating. No-till was initially scoffed-at — at a time when many farmers joked that it was “ugly,” or even “lazy,” farming. 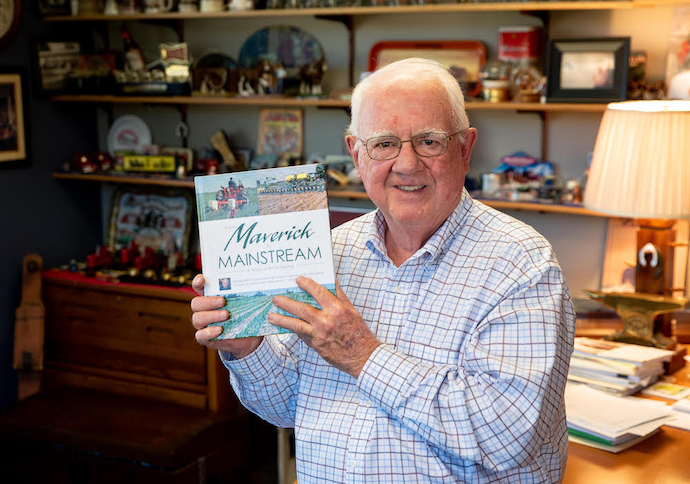 From Maverick to Mainstream is a chronicling of Dad’s personal history from the near-beginnings of no-till, as the only editor-in-chief of NTF since its founding in 1972. The concept was still in its infancy at that time, just 10 years after one “crazy” farmer in Kentucky tried it out on less than 1 acre. Grandpa thought Dad was nuts for uprooting his family and leaving a stable job at age 33 to cover a totally foreign farming practice. Many years later, farmers admitted to me that they’d been worried for Dad’s reputation in attaching himself to this crazy method. He didn’t realize it at the time, but that move to Wisconsin would lead to a ringside seat for 46 years of intimately covering a single subject, and later to an ag publishing company he and Mom started in 1981. For better or for worse, Dad and NTF were in it together. When the ag recession of the 1980s nearly killed his new company, Dad double-downed on NTF. His diligence was rewarded by farmers who mailed the subscription checks that provided just enough cash flow to continue the newsletter and rebuild as a 3-person company in the early 1990s. And because NTF kept afloat, it provided us the resources to eventually acquire Farm Equipment, Farm Catalog for Today’s Top Farm Operator and Ag Equipment Intelligence (then known as Ag Industry Watch) back in 2004. Today, Lessiter Media employs nearly 40 across several ag publications, digital properties and conferences. During Dad’s time covering no-tillage, the U.S. no-till acreage increased 29 times to more than 100 million acres today. Attendees at the annual National No-Tillage Conference shared how no-till changed their lives and even saved their farms during the 1980s — by taking on more land with less equipment and labor and learning how to modify planters and drills before they were commercially available. I’ve even heard Dad called the “Johnny Appleseed of No-Till” for providing a forum in the pages of NTF (and later the National No-Tillage Conference) where farmers could learn about and exchange knowledge on a promising but difficult way to farm. We’ve given Dad a hard time about this project’s deadline almost since he officially started digging into 40-plus years of archives of articles, photos, comic strips, ads and infographics. But I will tell you it’s been worth the wait. I’m proud of the contributions of Dad, and what he — and everyone in the ag community — accomplished together since 1972. “Viewing a collection of interviews, stories, pictures and advertisements of the infancy of No-Til (a trademark of Allis-Chalmers) takes me back in time to relive a new technology that transformed agriculture around the world. This practice was adopted in an area around Mr. Young’s more rapidly than one can imagine, as the book portrays. Having worked for an A.C. dealer close to this area in Kentucky, then for Allis-Chalmers and now a dealer, it is humorous that we have talked to at least 100 proud farmers who bought the ‘first no-till planter sold.’ Farmers and equipment companies portrayed in this story of the invention of no-till technology were pioneers in agricultural risk vs. reward. A great read.” — Tim Brannon, B & G Equipment, Inc., Paris, Tenn.
“Just received my Maverick to Mainstream ... Thanks for the inspiration. It will be great for me to spend more time learning and it sure has intrigue… conspiracies, spies, strongarm tactics and other shenanigans amid the search for truth. Very engaging and professional; a great piece of work!” — Jeff Bowman, Titan Machinery, Fargo, N.D.
A second-generation ag journalist, Mike Lessiter has been Editor/Publisher of Farm Equipment since 2004. He has covered business-to-business operations, manufacturing and marketing topics since 1992. He has also served in several capacities with the Farm Equipment Manufacturers Assn., Assn. of Equipment Manufacturers and is a frequent industry speaker. A graduate of the University of Wisconsin, he was named president of Lessiter Publications Inc. in 2007.